Amazon Product Page Officially Online! Yep! You read that right! My Amazon product page is officially online! I was told that it would be up and running within 5-7 business days of my approving the book for sale. Well, it ended up being less than 24 hours! This is fantastic! Before I give you all the link I just wanted to mention something that literally happened to me just minutes before typing this post. Obviously I have a lot of people who I’ve told about the book and who I’m pretty certain will buy it. But I sent a friend of mine, who I’ve known since 2006, the link to the Amazon product page and he sent me back the confirmation of his order of MY book. That’s a pretty good feeling. Because it didn’t matter to him what the book was about, though I’ve told him, all that mattered was that I wrote it and that was enough. I hope I have more stories like this one to share with you guys. Should you decide to purchase my book, I encourage you to post a review on Amazon because I look forward to reading what you have to say! And know that I am so appreciative to have you guys to share this entire experience with. You all are almost like family. Almost. Also, follow me on Twitter so you can read my random thoughts, mostly on writing, but also on all things! I’m a little lonely over there because I just started using my account. Help me out! I’ve added the My Book page for you to easily access a short synopsis of my book along with the links to Amazon and CreateSpace. Take a look. My Book, Divided Within, Available Now! 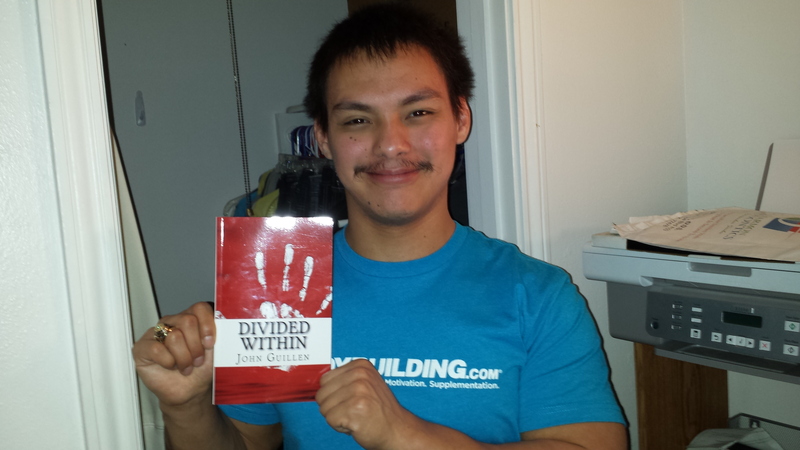 MY BOOK, DIVIDED WITHIN, IS OFFICIALLY FOR SALE! How amazing is that? I knew that my copy would be arriving today, but still that first time I laid eyes on it….I can’t even describe it. It is absolutely perfect. It really did bring tears to my eyes. It’s so pretty! I said when I graduated back on May 18 that it was the best day of my life. I think October 29 took the top spot today. It’s all just so grand. I have a surprise for all of you! You guys have followed every step of my progress during this great journey and I want to reward you, so to speak, for that. My Amazon product page will be up and running within the next few days, but in the meantime I wanted to at least offer you guys some incentive to go out and get it before it’s available on Amazon. I self-published with CreateSpace (I’ll have an entire post dedicated to my experience with them in the coming days) and the book is available now from their eStore. Normally the customer pays the full list price and then another $3.59 standard shipping. So in this case that would be $9.49 plus $3.59 = $13.08 total purchase price. That’s no fun. So…I’d like to make an exclusive offer available only to my blog readers and followers: I’ll cover the cost of shipping! You’ll pay the 9.49 and not a penny more! Doesn’t that sound a bit better? All you have to do is click here to navigate to the CreateSpace eStore and enter discount code PX24LVW7 prior to completing checkout. It will show the discount coming off the list price of the book. So your cart will have the list price of the book at $5.90 along with the price of shipping at $3.59. This is because I can offer the discount off the book and not the shipping, but it’s exactly the same! Here’s the back cover text for those of you who may have missed it the first time I posted it a little while back. Andrew Banks is hired by sixteen-year-old Mercedes Vega to work his first case. He soon learns that Carlos Vega, her father, is mixed up with the wrong people. He finds himself in Bellaire, one of the wealthiest parts of Houston, only to discover that not all of its residents are as innocent as they look. He must stay a step ahead of the Bellaire millionaire he’s pursuing before it’s too late for the entire Vega family, and for him. I’d love for some of you guys to take advantage of me doing this! It’s for you all! Thanks for sticking it out with me! Now I just have to sell some books! I received an email yesterday telling me that my physical proof has officially been ordered and has shipped! The great thing that I’ve seen happening around me is that a lot more of my personal friends have been keeping up with my blog than I’d previously thought. I know of several people who read every post and are genuinely excited for the book’s release, but lately people who I didn’t even know read my blog at all have been asking about its imminent release and the price and where they’ll be able to buy it and all that fun stuff. Isn’t that exciting?! People want to read MY book! I’m always quick to tell them that we are now just days away rather than months or weeks. The best part of being asked about my forthcoming book is that I’ve been receiving a lot of congratulations for my accomplishment. It’s not necessarily that they know how difficult a task it was for me, but I think it’s more to do with the fact that most people don’t personally know someone who has written a book, especially not someone their age and who they’ve known for years. I don’t need any special attention for what I’ve done, but it’s nice to see the people around me appreciate what I’ve done even before getting their hands on the actual book. Now I just have to bribe them into giving me nice reviews on Amazon! Only kidding. A little. Ha. You’ll recall that I finally got around to writing the first chapter of my second book last Friday. Well, unfortunately it took me an entire week to get up the courage to start the second chapter. I always said that the first five or so chapters of a new book are the most difficult because the story isn’t developed enough to dictate what’s written next. This chapter was slightly more difficult to write than the first one, but I didn’t spend hours upon hours banging my head against my desk wondering how come the words I wanted to write weren’t coming to me. I did, however, have a few periods while writing in which I stared intently at the computer screen hoping for the next sentence or paragraph to suddenly appear. It never did. I actually wrote this chapter in one sitting, which I hadn’t done in some time. Maybe it wasn’t as difficult as I thought. Anyway, a little about the chapter. I told you in my post last week that Andrew is hired by a prominent activist and that it is a topic that is current. In chapter two Andrew gets to sit down with Sydney for the first time and discuss the new client and what it might mean. He realizes that Sydney knows a lot more about his client than he does and she’s able to give him some perspective. Andrew’s got a lot of work ahead of him if he’s to satisfy the needs of his new client. Aren’t you all happy to finally hear about Andrew and Sydney again?! I know I’m happy to be writing their perfect relationship again. I’ll be sure to let you all know as soon as I have my proof in my hands and when a new chapter finds its way onto Word! Ahhh! This makes me so happy! Be honest, you know you are too. And it looks like they are too! I hadn’t anticipated receiving a physical copy for review. When I first started the process about a month ago I was given the option as to whether or not I wanted a physical or digital proof. I was given the same option upon submitting my manuscript for formatting, and both times I chose digital. I know, I know I should always inspect the physical proof because a computer screen can only show you so much, BUT a physical proof adds more than a week each time I need one. That’s too long. That’ll be me when I get my copy! I cannot wait for some of you guys to read it. This is the first time that I’ve posted multiple posts during a single day, BUT I’ve never had greater news to report to you all! My first post this afternoon revealed that I finally received my final revised proof and it had but one single change that needed to be made. Well…it was made and I approved my final proof just minutes ago! I was hoping to be able to complete the rest of the setup process but it turns out that there are still a couple of services that I wasn’t thinking about that still need to be taken care of before publication. I tried to find a timetable for these things but came up empty. It surely won’t be too long because even the major stuff has taken less than a week and the remaining items on the to-do-list are relatively minor. This is it! If you’re ten percent as excited as I am then I’m not sure that you’re able to get through your work or school day. I apologize for that. Many of you probably know that there have been some issues regarding my final proof. First I received a proof that contained all of my corrected mistakes still uncorrected. Then I was forced to wait another few days to receive the actual revised proof. Until yesterday. I finally received my final proof and am happy to say that all of my changes were made! Well…except for one. One of the changes made was slightly off from what it was supposed to be. 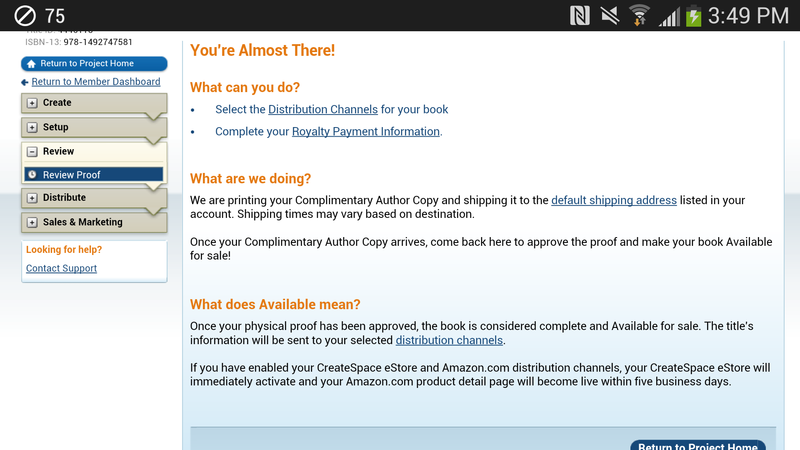 BUT this means that I’m now inching closer and closer to the release of my book! I’m told that my book will become available for purchase within two business days of my approving the final revised proof. Although I’m not sure if they limit their release dates to Tuesdays like would be expected of traditional publishers. Anyway, this is absolutely fantastic news! I fully realize that my book will not be for everyone and there will be some who very much dislike the story or writing or a mix of the two, but I don’t care. A few people have read it and I’ve been dying to have some of you read it. Are you ready?! I know I am. Also, I added a couple of paragraphs to my About Me page discussing what I think most helped me become a better writer and how come I my degree is not in something like creative writing. Check it out. I had hoped to receive my final proof today, but unfortunately it didn’t happen. So I’m convinced that I’ll have it for my viewing sometime tomorrow. Hopefully. A million posts ago I may or may not have mentioned that I don’t believe in the so-called “edit while you go” philosophy. I don’t know if this is even a term that people use, but I’m talking about editing my writing as I write it. For example, writing an entire chapter and then immediately editing it afterward. My reasoning for being against this practice was that I thought it would force me to stay focused on only a small portion of the entire work rather than continuing to move forward. I was wrong. When I had to go through and edit my first book I realized that rather than spending a short amount of time editing after each chapter that I had forced myself to spend hours editing the whole book. And my book is fairly short. I ended up spending a lot more time editing the final product because I failed to do any during the actual writing. What’s my take from this? Well…this whole writing thing is not an exact science. I figured that I’d have to do a little trial and error before I really got into my own little groove. I mean, there are still many practices that I know many other authors adopt that I haven’t found the need to. Like writing every single day no matter what. I don’t believe in this because I very much disagree that bad writing is better than no writing. Bad writing is bad writing. Period. So, I wrote my entire first book without ever having the need to write every single day. No new chapter to discuss yet, but you all will know when there is!